Since buying my new Mac, I'd been wondering what to do about my lack of Word and Excel programs on it. I could use the basic TextEdit program for minor bits of writing, but I don't need to do that very often. What I really wanted was to be able to play with complicated financial spreadsheets at home! It's been such a long time since I've been able to easily do that. On my old Mac, I had to run the OS9/Classic operating system to use Excel, which was a nuisance so I never did it. I ended up doing all my spreadsheets at work. Which I really didn't have time for unless I stayed late and blew off the gym-- not good. So with the new Mac, I wondered what to do. First thing was to call my friend Mortimer, who I thought might have an extra copy of Microsoft Office. I am not advocating software piracy here, but it sometimes comes with multiple user licenses and I liked the idea of "free!" But Mortimer wasn't able to help me. Next I considered buying Microsoft Office. It's about $150 for the Home/Student edition, which should do more than enough for someone like me. But the customer comments on Amazon made it sound kind of buggy, so I stopped just short of hitting the "buy now" button. Then I wondered about Apple's iWork-- that was only $79, but it sounded like I could potentially run into some compatibility problems if I was emailing files to PC users. Some of these "problems" might have been the misguided rants of crazy Amazon customers, but it was enough to make me hesitate about spending so much money. I tried looking on some Mac forum elsewhere, I don't even remember which one, and noticed a mention of a program called NeoOffice. It's an open source, volunteer-developed Office-type program. They ask that you make a donation before downloading it, but it can be as little as $5. I decided to give it a shot. I'm looking forward to posting a lot more financial charts and spreadsheets now! Thank you NeoOffice! 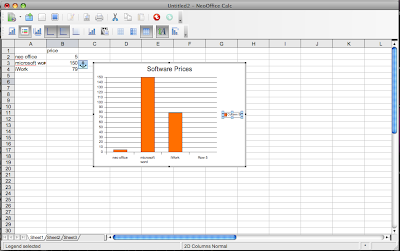 Similar to NeoOffice, there's another Open Source project that I think has been around longer and is probably better-supported (as well as cross-platform) called OpenOffice. It's a solid suite of apps, I like it. Be sure to give that one a browse, too. Here's another thought -- how about Google Apps? I assume they're free, like all the other stuff from Google. I use Office for Mac and very little problems at all! In addition, as a student my university provides the software for $45 (maybe that is an option for you)! I believe that you can try iWork for free for 30 days. It's spreadsheet charts in Numbers are dazzling! I use both Google docs and openoffice.org (on windows) and they are both great *free* software. Ooh I can't wait for all the graphs and charts. Like Curtis, I was able to get the entire Office suite for my Mac for $20 due to the Home Use Program. I have also used Open Office in a previous job and it was great! And you can always check for reviews online (mac life and mac world magazines). Wow, thanks for the tip. I've been dreading replacing my Mac, who is on her last leg, due to software issues. I know a few teachers and students who said they'd be willing to use their discounts to set me up. i'm a total google docs convert. i've got my novel, weight-food-chart and check-book on google docs. Plus, i'm using it as a backup for older files i want to have access to. plus-plus, i can access these documents anywhere, so i don't have to drag my computer with me on all my trips. personally, i never want to buy microsoft office again. if i can avoid it. mo disturbs my mac aesthetic. When I got my new Macbook, I bought the Student/teacher edition new and then sold the remaining two licenses on eBay - I almost got my version for free!